Today I have cleverly managed to combine our Sunday Evening Video for the week with an entry of the 2017 PopCult Gift Guide. 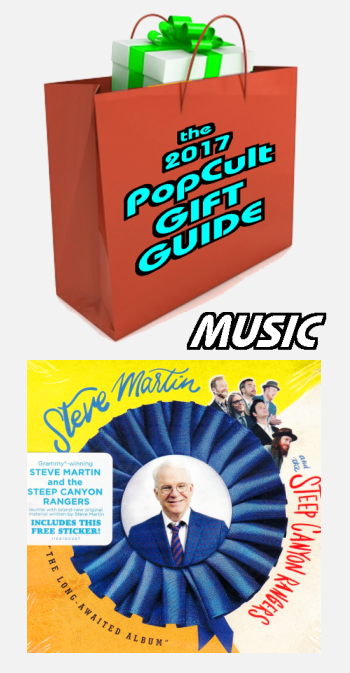 Above you see “Santa Fe,” a brand-new mid-centurty design-style animated music video by Steve Martin And The Steep Canyon Rangers, and it’s on their BRAND-NEW album, coincidentally titled “The Long Awaited Album,” which we are recommending as the pefect gift for the lover of traditional and old-time music (some people get irate if you call it “Bluegrass”) on your holiday shopping list. It’s also great for fans of Steve Martin’s comedy, as he has managed, with this album, to combine comedy with Bluegrass without venturing too far into the field of novelty music. You will find Martin’s trademark comedy here, and it’s accompanied by first-class musicianship. Martin sings three funny tunes, and turns the vocals over the Steep Canyon Rangers’ Woody Platt for songs that require prettier singing. There are also some short instrumentals, just to keep the record moving at a brisk pace. You can find The Long Awaited Album anywhere that sells music. I’ve even seen it at Cracker Barrel. Later on Sunday check back for the 2017 PopCult Gift Guide Cyber Monday Preview, a guide to ten offbeat online retailers who have tons of cool stuff turn you into the guru of gifting this holiday season.